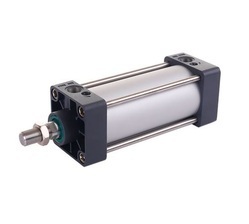 Our product range includes a wide range of at standard cylinders, standard cylinders, compact cylinders, hydro pneumatic cylinder, micro cylinder and double acting hydraulic cylinder. Following the set universal norms, the offered cylinders are manufactured by our vendors at their well-equipped production unit using the top quality raw material. 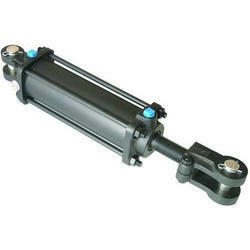 Furthermore, customers can purchase these cylinders from us at rock bottom rates. In order to ensure its excellent performance, the offered cylinder is duly tested on different measures by a team of skilled professionals. 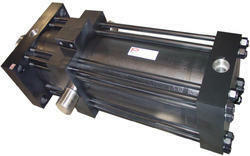 Our domain expertise has enabled us to come up with an excellent collection of Standard Cylinders. Procured from some of the reliable vendors of the industry, the offered cylinder is manufactured using the best quality raw material and progressive technology in accordance to the set international norms. It is strictly examined on varied quality parameters in order to ensure its unmatched quality. Owing to its easy operation, the offered cylinder is highly acknowledged by our valuable customers. We have marked a distinct position in the domain by trading, distributing and supplying the best quality Compact Cylinders. 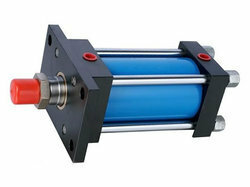 Our offered cylinders are used in different industries owing to its varied salient features. These cylinders are manufactured with the help of the finest quality raw material and modern techniques in compliance with the international norms at our vendors' premises. Moreover, customers can purchase the offered cylinders from us in several technical options as per their specific needs. 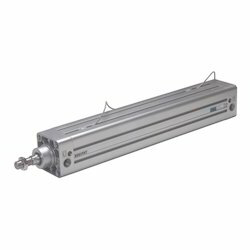 ‘N’ series Hydro-Pneumatic Cylinders are independent power units that can be purchased separately and further integrated in to larger systems. They are available in tonnages starting from 1 tonne and going all the way up to 45 tonnes. We are the famous trader, distributor and supplier of premium quality Micro Cylinder. Procured from some of the certified vendors of the industry, this cylinder is manufactured with the help of high-class raw material and modern techniques. In order to ensure its premium quality, our offered cylinder is strictly checked by our quality inspectors on several quality measures. Moreover, customers can avail this cylinder from us at nominal prices. 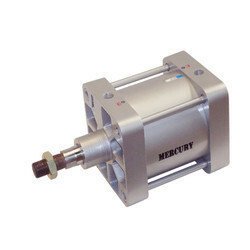 ADVANTAGES OF MERCURY "AIR TO AIR BOOSTERS"
Efficient use of plant compressed air. Once pressure has built up there is no further consumption of compressed air. The booster reciprocates in proportion to demand. 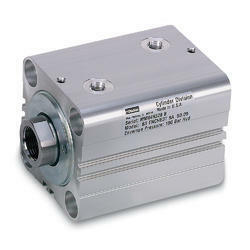 Automatically compensates for leakages and maintains the set output pressure. Can be used in explosive environments as all components are pneumatically actuated. All critical components can be accessed and serviced without opening the main booster. Cost saving. 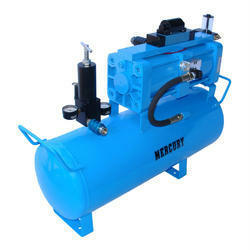 Eliminates the purchase of a high-pressure compressor as it works using the existing shop air. 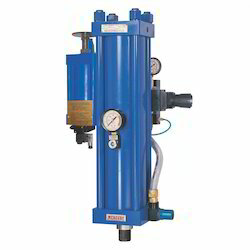 Can be used as a stand-alone, back up source of compressed air in the event of failure of mainline compressed air. Automatic and adjustable lubrication through our unique AUTOLUBE PUMP. Cyclic pressure/life testing of Pressure Gauges, Pressure Switches, Hoses etc. Burst Strength Testing of pressurized vessels such as LPG / Nitrogen / Oxygen gas cylinders, storage tanks, hoses, pipes etc. Seat leakage test of Control Valves. 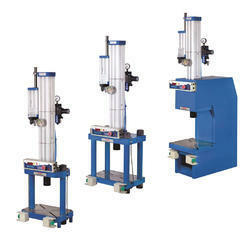 Operation of pneumatic cylinders, clamps etc. for applications where limited quantity of high-pressure air is required. 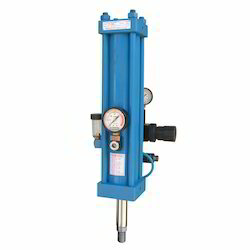 A portable source of compressed air at the pressure higher than plant pressure. Due to our honest business standards and transparent deals, we are steadily making our way to the platform of success by offering superior grade Hydro Pneumatic Cylinder. 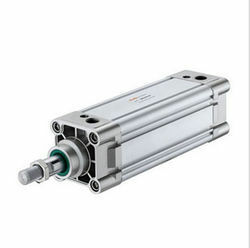 The offered pneumatic cylinder is manufactured using premium quality raw material and modular machines in strict compliance with the set industry standards. 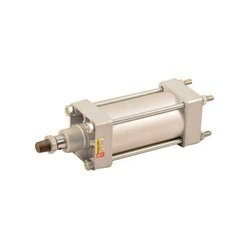 Our offered pneumatic cylinder is strictly tested on different measures before being dealt to our customers assuring its flawlessness at user’s premises. 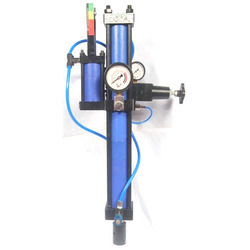 Hydro Pneumatic Press Cylinder system is used for applications where the job is automatically fed into the die and only a short travel is required for pressing.